The Picasso Dining Chair Black is a striking and stylish item that will enhance any dining area with its impressive yet simple design. Gracing homes with a touch of modernity, the Picasso is the perfect masterpiece for your dining room and beyond. Covered in smooth black faux leather, the seat includes a dense foam padding for lustrous comfort. The high arched backrest offers ergonomic support whilst providing the chair with an eye-catching silhouette. Meanwhile, the comfortable seat stands on four chrome plated legs that give excellent levels of stability, as well as having protective pads beneath to help keep your floors free from scratches. 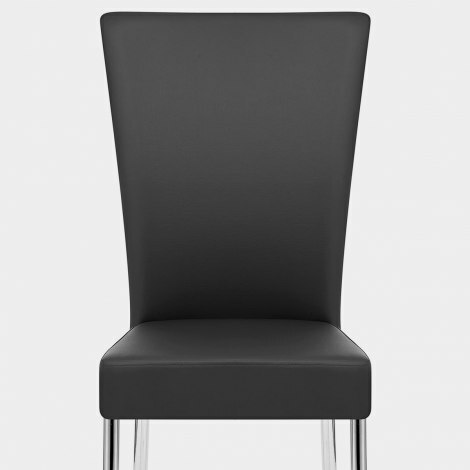 "Good value for the money, dispatched very quickly"
Bought to of these chairs for xmas dinner. We had 4 chairs already but with 2 extra guests for dinner needed 2 almost matching chairs. Delivery was fast and I was kept informed. The chairs were very easy to assemble and perfect, looked good with original chairs and are very comfy. I will definitely be changing all my dining chairs to these. Would highly recommend the chairs and Atlantic Shopping for their excellent service. these chairs were exactly what we wanted. Finishes off our new kitchen very well. Good quality easy to put together and fast delivery what more could you want. Picasso Dining chairs - excellent value for money. Had been after two chairs for our new kitchen and these are perfect. Free delivery as well.